EXCLUSIVE: ‘Fantastic Beasts’ Stars Tease Tomorrow’s Trailer Release with All-Day Fan Event! The stars of Fantastic Beasts: The Crimes of Grindelwald congregated in New York outside the Today Show studio early this morning to kick off a day-long fan event building up to the release of the final trailer from Warner Bros. tomorrow! 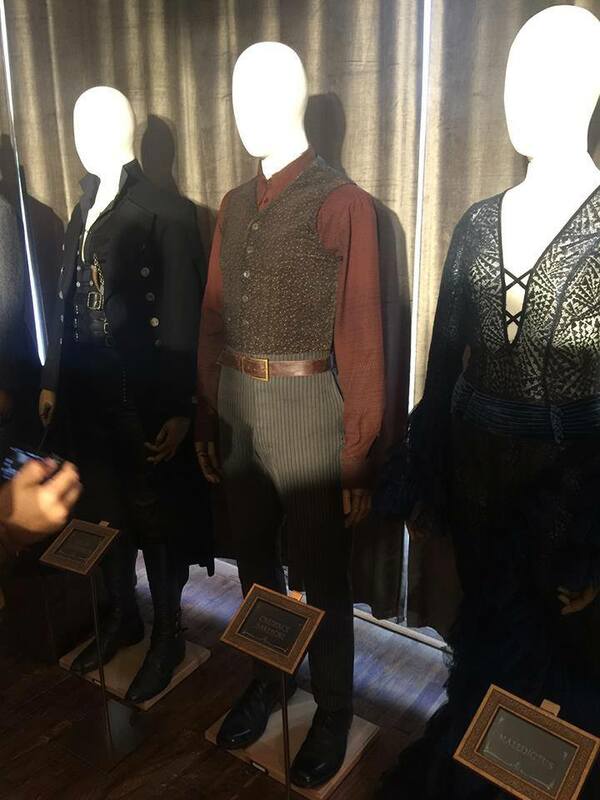 Fans screamed and cheered behind the delighted cast members, including Callum Turner (Theseus Scamander), Zoe Kravtiz (Leta Lestrange), Claudia Kim (Maledictus), Ezra Miller (Credence Barebone), Alison Sudol (Queenie Goldstein), Dan Fogler (Jacob Kowalski) and Katherine Waterston (Tina Goldstein). Waterston’s onscreen counterpart, Eddie Redmayne, who plays the wonderfully-awkward and compassionate magizoologist Newt Scamander, was noticeably absent (as was Jude Law), but Redmayne did send a brief video message for fans. Redmayne is presumably on location filming The Aeronauts with former The Theory of Everything co-star Felicity Jones, and he was sorely missed, but Warner Bros. and the Today Show did not leave fans disappointed! J.K. Rowling, author of the Harry Potter series, screenwriter of Fantastic Beasts and creator of all wizarding world magic, surprised lucky fans by joining the Crimes of Grindelwald cast for a brief teaser interview. 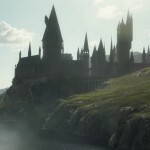 Rowling divulged, “I know about the next four things I’m writing…I’m scared I’ll die before I get it all out!” Inquiring minds were immediately curious whether that would include further forays into the wizarding world but, other than her confirmed work on the next three Fantastic Beasts screenplays, Rowling would only reveal that she’s also mulling over the Robert Galbraith Cormoran Strike stories. After the Today Show, fan-site representatives embarked on a series of magical activities and events. Leaky correspondent and contributing editor Amanda Kirk was onsite to bring fans an inside look at all the excitement. 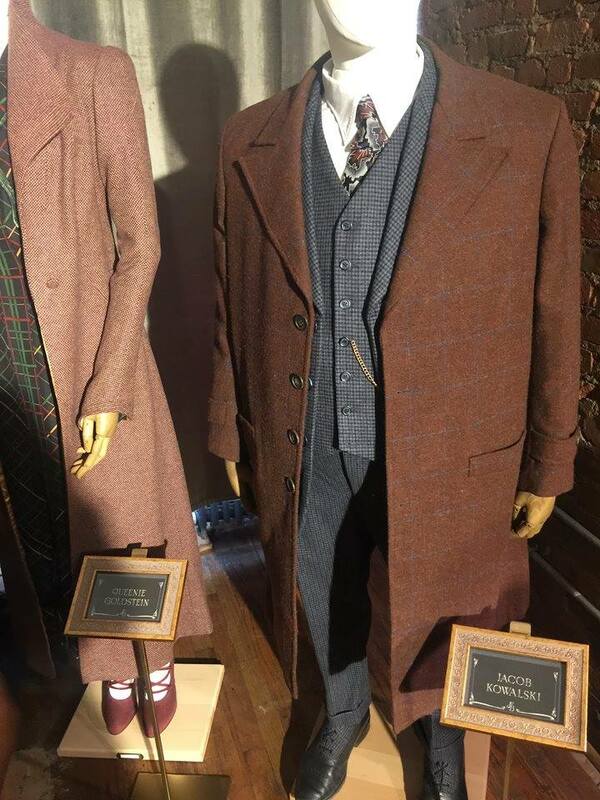 Before leaving the overwhelmed Potterheads, Rowling gave the following advice as they prepared for a special advance screening of the trailer–and hear it with your own ears in the video shared by the official Fantastic Beasts Instagram account! If seeing the new trailer a full day early wasn’t thrilling enough, those reserved seats were for Claudia Kim, Ezra Miller, Callum Turner and Dan Fogler, who accompanied the group into the screening room! After viewing the trailer–which they got to see THREE times!–Kirk had the pleasure of speaking with Ezra Miller about the films. They talked briefly about the evolution of Credence’s haircut, and Miller joked that it was always possible Credence would decide to own the “bowl cut” at some point, but then they got back to the topic at hand. Amanda also caught up with Dan Fogler later in the day, and when asked if he knew what was going to happen to Jacob’s bakery whilst he’s in Europe, Dan said he hasn’t the foggiest, but that he hopes Warner Bros franchises it! Kirk then met Pierre Bohanna, the prop master who designed the intricate details of the iconic wands used by our favorite wizards and witches in the films. 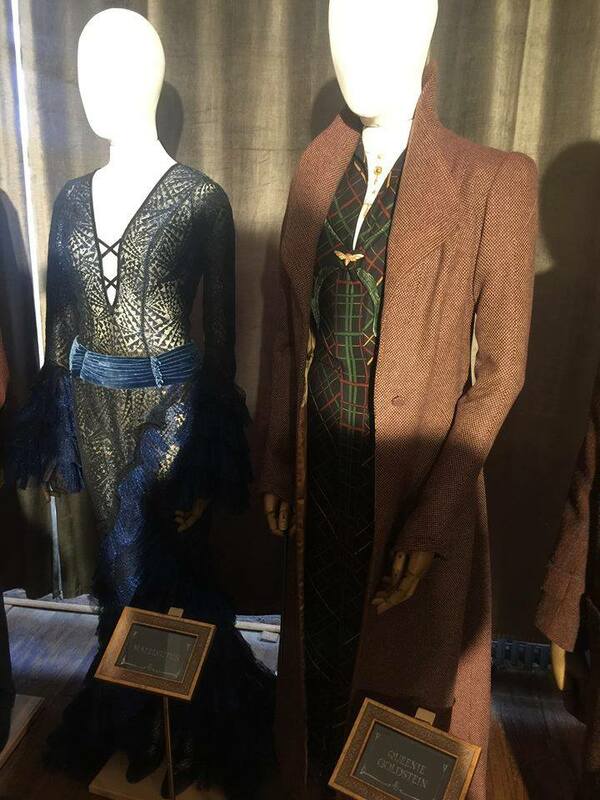 Bohanna also discussed the designs for the wands of Nicolas Flamel and Queenie Goldstein. Watch the full discussion with Bohanna below, including comments on his wands for Theseus and Rosier as well. In a one-on-one interview, Kirk had the opportunity to question Bohanna about the specifics of wand repair and personalization. He explained that, in his personal opinion, the core is what is personal, but that the “housing” can change. For example, Malfoy’s wand wasn’t in a cane when he got it at 11. She also asked how Harry Potter could break the Elder Wand without repairing his, and Bohanna speculated that Harry could put the core in new housing. Very interesting, indeed! Leaky even got to duel MuggleNet, and since Kirk found herself in possession of the Elder Wand, we’re willing to bet she fared quite a bit better than Draco did when he met Harry on the dueling platform! 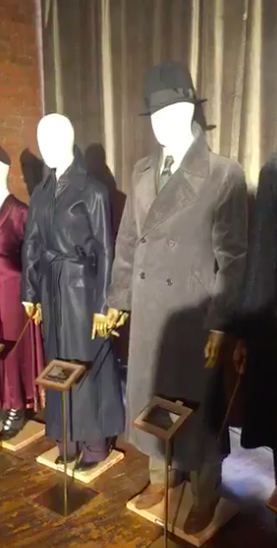 Kirk then got an enviable look at some of the costumes worn by the cast in Fantastic Beasts: The Crimes of Grindelwald, many of which will be seen in tomorrow’s trailer. 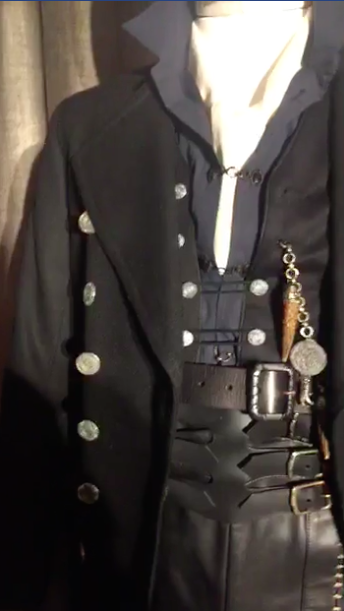 Follow along as she gives detailed descriptions of the costumes, beginning with Jacob Kowalski’s wool suit and moving on to Queenie, Maledictus, Credence Barebone, Gellert Grindelwald, Newt Scamander, Albus Dumbledore, Tina Goldstein, Leta Lestrange and Theseus Scamander, in order, and check out the close-up images below. Watch the full discussion with Atwood below, including additional details on the costumes of Maledictus and Queenie! And that final exclusive wrapped up a magical day leading up to tomorrow’s big reveal. What are you hoping to see in the new trailer, Potter fans? What teasers from today’s interviews and events have you all the more excited for its unveiling?! 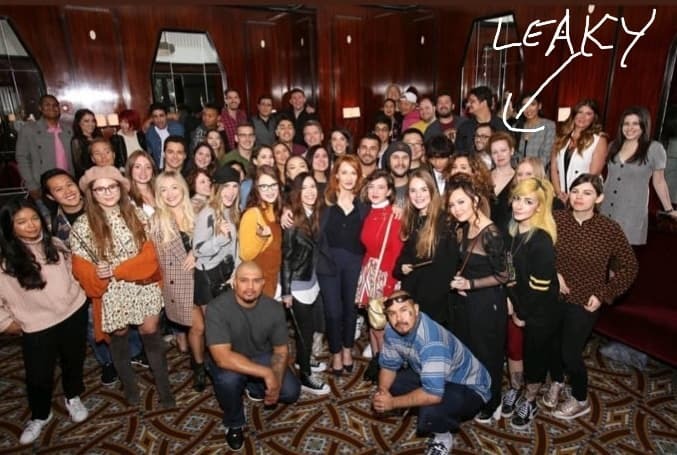 Everybody here at The Leaky Cauldron would like to say a huge thank you to Warner Bros for putting on such an unforgettable event for fans, and to Dan Fogler, Eddie Redmayne, Alison Sudol, Katherine Waterston, Ezra Miller, Callum Turner, Claudia Kim, Zoë Kravitz, Colleen Atwood, Pierre Bohanna, and – of course – J.K. Rowling, for making it such a magical day!